As one of the official harbingers of spring, rhubarb is on my list of “I’m so excited to be eating what’s growing in my backyard ”. Technically its growing in my neighbour’s backyard……..but, thankfully, they share it with me. Luckily for everyone concerned this has obliterated the stealth missions in the middle of the night armed with a flashlight. Super tart and bordering on sour you need a lot of sweetness to make the stalks edible, but never ever try to eat the leaves – they’re toxic. Field versus hot house. 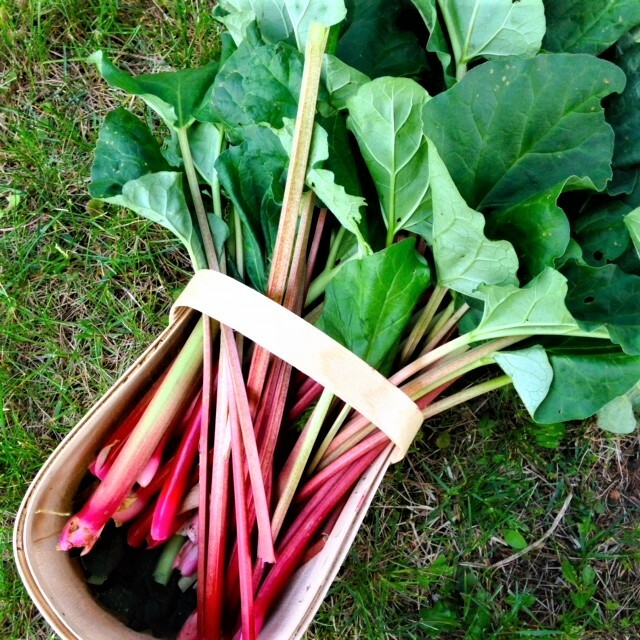 The stalks of field rhubarb vary from shades of green to deep ruby red depending on the variety, hot house tends to be more pink. As with all vegetables or fruits that have a stalk look for crisp, firm ones. And like all super models perky counts – look for perky leaves to ensure freshness. If you are picking fresh, pull the stalk from the bottom up to get the entire stalk. Cut off leaves and discard. To store wrap the stalks in damp paper towels and place in a plastic bag for up to one week in the fridge. Or chop into 1-inch (2.5 cm) pieces and freeze for up to one year. Rhubarb boasts a host of beneficial nutrients, its high in fibre, it also contains vitamin C plus it contains lutein and zeaxanthin for healthy eyes. Have any dingy looking stainless steel pots? According to the Rhubarb Compendium you can use rhubarb to clean them, no elbow grease required. Just boil up some chopped rhubarb with water in a pan and it will come clean. They suggest: An application of rhubarb over the afflicted area will bring back the shine in next to no time. Environmentally friendly too! I want to know how much sour cream goes into the sour cream rhubarb pie in todays Province paper. I would like to make it as it sounds very good. i do make the rhubarb honey ginger sauce just love it. In the Sunday Province there is a recipe for sour cream rhubarb pie but there is no amount of sour cream mentioned in the ingredients for the pie. I would like to know how much sour cream to use. It was 1 cup of sour cream, cant believe that was missing!